CARFAX CERTIFIED ONE OWNER!! 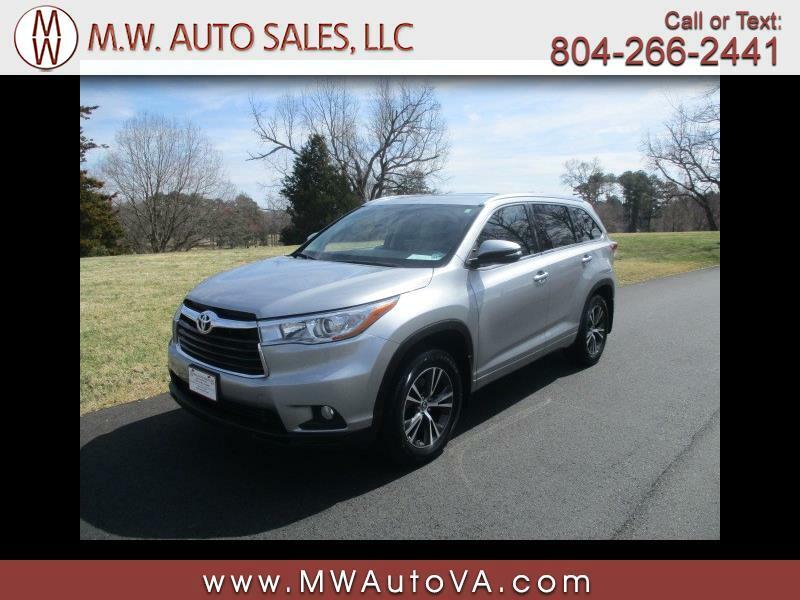 We are pleased to offer for sale this meticulously maintained 2016 Toyota Highlander XLE AWD finished in an original celestial silver metallic exterior over a matching grey leather interior that has never been smoked in. This Highlander comes loaded to the gills with power drivers seat, heated front seats, power liftgate, power moonroof, navigation, backup camera, and dual zone automatic climate control. Visit M.W. Auto Sales online at www.mwautova.com to see more pictures of this vehicle or call us at 804-266-2441 today to schedule your test drive. WE WELCOME ALL TRADE IN'S AND WE WANT TO BUY YOUR CAR TODAY!! *Prices do not include tax, tags, title or $299 Processing Fee. *We are not responsible for typographical errors.